An aerial shot and taken late enough to invoke the power of the Flash. I hate that. Usual suspects and the faithful notebook which suggests, quite rightly, that I'm noting the ingredients for the card that is currently on the ipad's deckchair. The ipad is in the kitchen where I was listening to something on iplayer when I realised how late it was getting and how silly it would be to forget to do the WOYWW thing. Yep, the days are running away with me. The heart shaped ramekin was being used for some Pearl Ex painting, so now I'm leaving the water to evaporate so I can re-use the mica that's settled at the bottom. A second pot of chewing gum...Spearmint this time, living on the edge, that's me. The syringe is my dispenser of choice for silicone glue..I wrote a post about this fixative HERE is you're interested. Post a pic of your work surface on your blog, put WOYWW in your post title and link here. Please link a relevant post - not an article you posted on Monday...an article you wrote for Wednesday's Workdesk visitors. Thank you. Told you my body clock wakes me at 1.30 to link! will look at your desk "tomorrow"!! Love the look of that card in the deck chair, will need a closer look please! Heart shaped ramekins! Whatever next! Yup, it's getting close to flash time again, unless we can grab a photo at the weekend, still, only nine more weeks until the days start lengthening again!! Wow Julia. This is truly the calm after the storm. Very impressive. Or maybe it's just the overhead shot that did the trick. That is a very Christmas-y card you have shown. Love it, though. Have a super week and don't chew too much gum! Happy WOYWW from # 2 this week. love that card on kraft, like the mica recycling! Well here I am across the pond posting early--I'm having a hectic little week. But none the less..feeling creative--and love your desk today! Hugs dearest! I'm glad I'm in good company. Days and weeks are running away from me also. I think it's the time of year. As much as I love it, I always feel behind. Have a great week. I've enjoyed reading the posts from those who attended, what must have been, a fantastic crop. Good on you! Great job young lady! Well, it's short and sweet (for a change)and finally it's Wednesday British time! Looking forward to the stories of the crop!!! Loving your desk today Julia esp the heart shaped ramekin. Love the aerial shot! My title this week is almost the same as yours!! Really, #176!!!! Isn't it amazing how after 176 weeks, every desk is its own artistic creation? Hmmmm, love the Pearl Ex re-use idea. And why not use a heart shape if it makes you happy? Good for you on the early Christmas card. Dunno that handmade greetings will happen around here this year. Thanks for your lovely comment re those "backgrounds". I really like that item you have on the upper left corner on what looks like an easel. It looks like a heart and has beautiful embellishments!! You always have such an interesting desk!! Well, thanks to being awake at 4am, I've made the top 40!! But yes, I'm also using the flash to get the photos... Very dinky ramekin, and is that an Iced Spruce DI? I've just ordered a couple of the new colours - very excited. Happy WOYWW! Thank YOU for taking the time, Julia, week after week! It's been fun seeing your post (and others) about your crop on Saturday. No wonder this WOYWW almost slipped your mind. Feels like mine is layered in banana peels lately, things are slipping out of it left and right! Would be fun someday to meet up...I see all you WOYWW'er's at your crop...so jealous you all get to hang out. I am sure I need to fly clear across the world to attend the next one, don't you? Lovely creativity on display today... I see evidence of Christmas (holly leaves have been die cut) how could you? It's October!!! Thank you for hosting us all again! I love that card so far. You're organised, writing notes on how you did it. I have heaps of note books but never seem to remember to write in them. Cute little pot and good that you are like me and reuse things. Now, that's a nice calm looking work space. Love the card, looks nice and clean (not one I could make then lol!). a very calm desk indeed, the card looks interesting, I'm just starting to use kraft card too. Like the idea of re cycling the mica but it's like waiting for paint to dry! can't wait that long I should be re named the impatient crafter. he he. Great aerial shot Julia have a super day. I'll be back later to catch up. Thank you so much for the tip about letting the water evaporate so you can use the mica. Just brilliant. Fab crafty desk today Julia, very tidy and organised. Every week I look at your dekchair ipad holder and think I need one of those ... I really must get round to getting one! Very calm desk this week Julia. Rather calm and serene on your desk today Julia.......have a lovely day. Yep! I am here AGAIN!! Pretty looking card there Miss and I do hope the lid is shut properly on the Blending solution!! Thanks again for Saturday....loved it, want to do it again Miss! It is great I can see the faces behind the desks now including yours. Good morning and happy Wednesday. That card looks fab! Well, you learn something every day………. I’d have never thought of waiting for the water to evaporate and then re-use the mica at the bottom of the pot. Thanks for the tip. It's getting darker at both ends of the day isn't it, Winter must be approaching!!! I'm on my way round to borrow your ramekin, DD needs 4 for her cookery class tomorrow and guess what we don't possess!!! I had to smile at your silicone sticky stuff. I spent a good half hour yesterday trying to unblock my tube, ended up completely stuck up and now it's all over my taps and can you shift it?????? I'm happy to say that I've made the top 100 this week lol - and in addition, I've actually posted on Wednesday rather than saturday - although last week, Saturday was the new Wednesday - how appropriate too for you... Saturday you met your Wednesday ladies!!! Please say you'll take it easy for a few days now the big crop is over - I know you are a busy lady, I know you have lots to do - but please promise to slow the pace for a bit. Looks like wonderful things happening here! The card looks like it is going to be beautiful and not too much of a mess on your desk this week. Dear Miss, Please excuse Jo from not having her homework finished but she didn't get home until Monday night and she was hyper excited and it's all your fault. OMG what is it with time speeding up with age? I am sure there is some mathematical formual to explain why. Love the size of your chewing gum container. Morning all. Love the card, and I use a syringe for silicone glue too- best way to dispense it, and the only wet glue I ever use. Something on my post about the WOYWWer I met last Saturday too! Nice to see everybody so busy. FAB Card . . . good to see you've recovered from Saturday. Spearmint is my mint of choice! Remember Pacers? I love your gentle little reminders about posting! We've been banned from having chewing gum since a nasty incident where some clumped in Wilbear's fur when he tried to blow bubbles with it! The bears, late today and only just written our post. Happy Wednesday. I put the blog post up hours ago and forgot to link it, ah silly me. Nice and active your desk, like the heart container with silicone in it. I think I will check out that link to find out more as soon as I can. 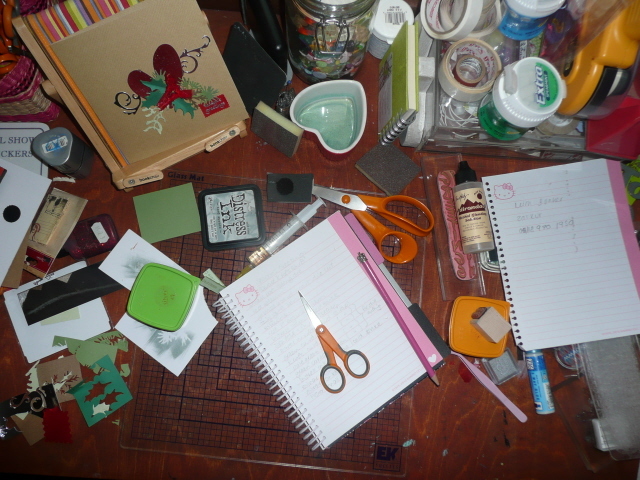 I love to see a busy desk, sign of a happy crafter! the card on the easel looks fabby too. You say these things and my brain says brilliant and then that other part of the brain says it isn't anything you'll ever do so forget about it! The notebook is such a good idea, yet I almost never, ever make the same card twice lol! still linking late but i'm here! neeed to have a closer look at your card. happy 176! Looks you have been productive. Like that heart and the foliage cut outs. Its great that you write down all of the ingredients for your card. I never do that, and then I forget what I used! Ooops, the one time you warn us about not posting bad links, is the one time I did, purely by mistake, I promise. Feel free to delete the offending link. And please don't be cross, I am sure you realize it's so easily done because the dialog boxes automatically fill in with the last link anyone posted using that same tool. Anyhow, lovely card. I am starting to move my Nook tablet around from studio to kitchen to bedroom too. But it always seems to be in the wrong place when I need it. Tamika #124 or #123 depending on the time the links are corrected! The card on the ipad stand looks really pretty. 'It's beginning to look a lot like Christmas' - I see red and green and holly - maybe need to start on Christmas cards myself soon? Love the heart pot Julia, have a good week. Your space is actually much cleaner/neater than mine today! I see some interesting items on your desk! Looking forward to blurfing shortly! Wow! What a great photo! Spearmint! You DO live on the edge! :<) I understand the days flying by - it seems I have been behind all year! As my mother would always say, "The faster I go the behinder I get!" Wishing you a wonderful rest of the week! been missing you in my business unpacking etc. The project top left looks beautiful. Great idea for the medicine syringe. I hear you about the days running away--good grief, who pushed the fast forward button? Do fast forward buttons even still exist??? Tick. tock etc, the minutes seem like seconds don't they?. Glad my desk is messier than yours this week, haha, love the look of your card. Happy WOYWW and have a great end to the week. I'm liking the look of that card. Will we get to see a closer view soon? Love the little ramekin too. A very late post from me today, but I do have a good reason! Happy WOYWW. I was gutted not to make Saturday so now I will go snooping to see what you all got up to. Today is the first day I actually felt well. Hi - I'm back!! Don't know how long for, but if there's something on my desk worth sharing, I'll be here! Love the card-in-progress on your desk, Julia, esp. the swirls. It's going to be stunning. Happy WOYWW, and thanks for all you do! I love that you employ the use of the ipod stand for art when it is not sitting there...heehee! I do love a good aerial shot! That card on the iPad stand looks fantastic and I love the Hello Kitty notebook :) I'm a bit late linking up today... Way late in fact, but I still made it. I keep meaning to have a notebook to keep my ideas in but always forget and then send my cards off before doing so. I will be more organised one day! I post late but have been around the world and back and have enjoyed it. Thanks to you! It's totally still Wednesday. It's not even quite 8pm where I am! Your WOYWW beast seems to arrive earlier every week. Or is it my disorganization. Do your write your post on iPad? I cannot post photos I take in iPad to the blog. One of the reasons I wanted an iPad. Look at your hello kitty note pad...now I've got your number! ;) Those tree like stencils look interesting.. I hope you have a creative week! Love your description of your desk. Thanks for linking the glue review too. I haven't been checking in for a while but always enjoy my visits! Well I made it but I'm sooooo late! What a clever idea to use the heart shaped ramekin...not just a pretty face then eh? Neesie at an incredible #154! Thank you for another WOYWW. I enjoy (when I can) to come and participate with you and the rest of the WOYWW creative people. Don't know if I have already commented. Love your heart ramekin. The card ofthe stand looks great. I see your blending solution. I just put some alcohol in a spray bottle instead of buying that, costs too much. Made my own applicators out of jenga blocks and felt too, cheapskate here. Love spearmint, trident is my favorite brand. Cool stuff on your desk! I have been enjoying your WOYWW posts for a long time now and have finally gotten up the nerve to link up! Oh no! Not the power of the flash! Anything but that! Is that a card for The Holiday That Shall Not Be Named sitting in the ipad deck chair? That's just wrong, immoral and possibly fattening. That's my story and I'm sticking to it. Thanks for sending good thoughts and brains my way. I think I did really good on the test! Anyway, would love for you to stop bny when you have a moment or 2. I've made my party bag challenge!! Her costume sounds amazing! I love G of T! I hope we get a peek of it on her!! WOYWW? 177 oops....I mean 178..
Foiling and Leafing and writing too much. Quick, While I'm in the mood..